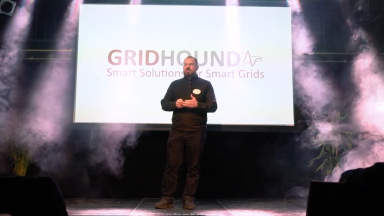 Gridhound is part of the Rockstart Smart Energy Accelerator Program! The official nomination of this year’s participants is still pending, but we are pleased to announce in advance that we will be there. Rockstart was founded in Amsterdam in 2011 with the aim of providing start-ups with access to the market, capital, knowledge and community. Since then, Rockstart has specialized in building entire ecosystems around specific areas such as Digital Health, Smart Energy and Artificial Intelligence. Rockstart is an international team of more than 40 people dedicated to supporting and developing start-ups to become scalable and turn their world around for the better. Until today, Rockstart has invested in more than 100 start-ups, helping them to raise more than 62 million euros and employ more than 630 people. After the first successful field tests in Germany and from our EU projects, we want to use the Rockstart Accelerator and its network to identify and take into account the challenges of the energy transition in general and the needs of distribution grid operators throughout Europe in particular. With our products SeAn (Sensitivity Analysis) and MoSES (Monitoring, State Estimation and Services), which require only a minimum number of measurements and thus also only a minimum number of hardware in the grid, based on a machine learning approach, we can provide the necessary observability in the distribution network for the integration of further renewable energies and further consumers, e.g. from the area of e-mobility. On the basis of this information, the network operators can relieve the network, guarantee a secure power supply and plan the expansion based on facts. I am happy to have been selected with Gridhound from over 60 start-ups and to discuss our topic with the expert mentors and the network of Rockstart. Today’s energy supply is on the verge of collapse; without intelligent grid control, which can only become intelligent through the observability of the grids, the energy transition is in danger. I think that with decreasing storage prices, power storage represents an important building block in the overall concept of intelligent grid control. Nevertheless, this intelligence cannot be achieved without innovative software solutions and other modules. Here I am also looking forward to the exchange with the other start-ups from the program. Distribution network operators are facing the challenges of integrating an increasing number of renewable energies. At the same time the raise of electrification of heat and transportation is changing people´s consumption habits, which puts a growing risk on network stability. Adressing these challenges, :agile accelerator startup Gridhound is inviting you to learn about grid awareness and discuss solutions that enable distribution system operators to proactively avoid problems and optimize grid operation. In this context Gridhound is one of the partners of the ADMS Horizon2020 Fast-Track-To-Innovation EU-Project. This event is the final dissemination event for the ADMS project. Your participation to this invite-only event, for experts of the energy and grid sector, is highly appreciated and your contributions to the discussions highly welcome. Send us an email to info@gridhound.de to request the link and password to the event organization portal.